If you have little ones at home or know someone who does, listen up! 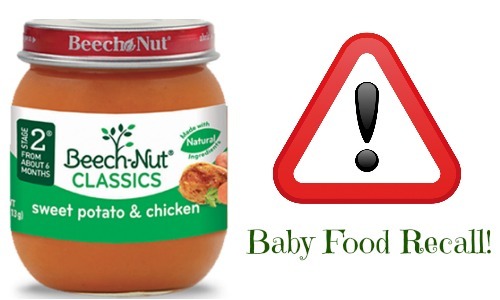 Beech-Nut Nutrition is recalling approximately 1,920 pounds of baby food products that may be contaminated with small pieces of glass. The baby food product was produced on 12/12/14 and the 4-oz. glass jars containing “Stage 2 Beech-Nut Classics sweet potato & chicken” are being recalled. The product has the establishment number “P-68A” inside the USDA mark of inspection and expires in “Dec 2016.” It includes product numbers “12395750815” through “12395750821” and these items were shipped to retail locations nationwide. The company has received a report of an oral injury associated with consumption so be sure to check your items at home. You can find out more information on the USDA website.